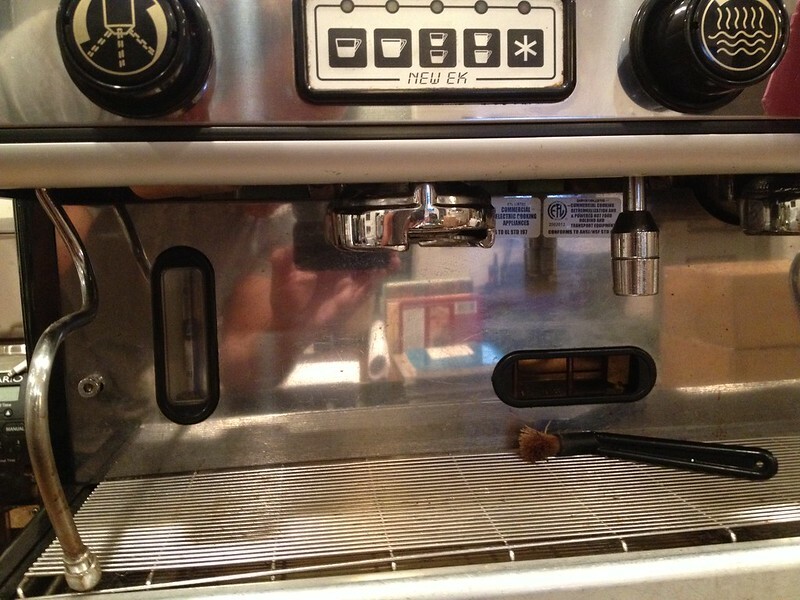 I picked up a La Spaziale New EK for a song in 2014. It was less than a song, the purchase was so good it wasn’t optional. And, when you have a wife that is as amazing as mine, you get to have a commercial 2 group machine on your counter. 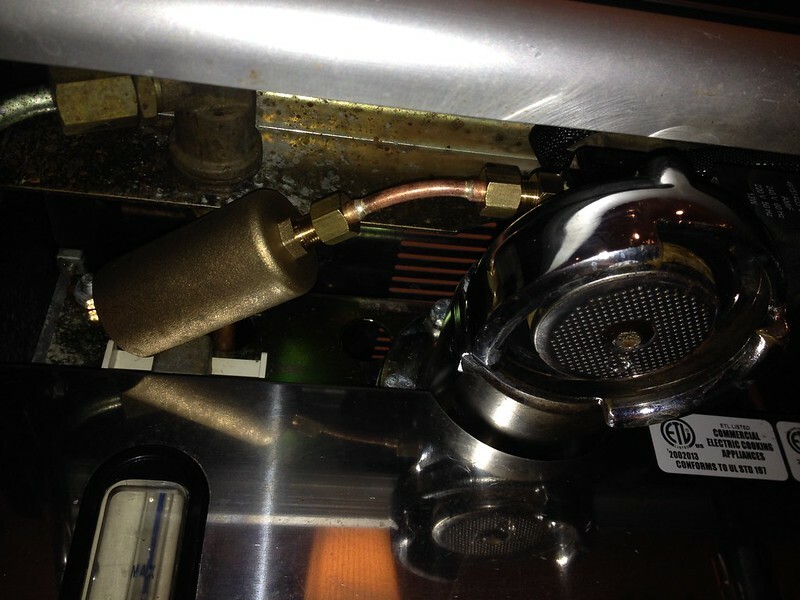 The machine is unique in the way the heat exchange takes place and in the fact that it uses a 53mm portafilter. The smaller diameter portafilter has a taller basket than you would find on your run of the mill commercial 58mm portafilter. After disassembling the machine last year (not that it needed it) to descale everything, I noticed that there is a port on the left side of the group heads with a brass allen headed plug in them. After poking around a bit, I found this pre-infusion kit for La Spaziale espresso machines at Chris Coffee. 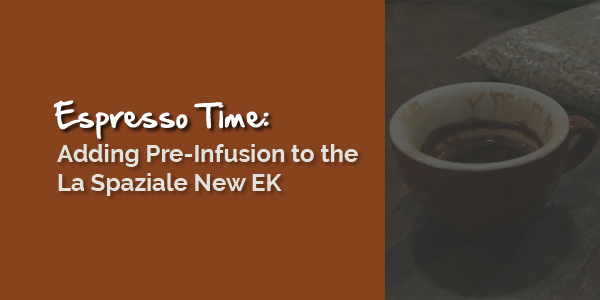 So, I tried to read up as much as I could over at Home Barista about the pre-infusion kit and pre-infusion in general. Suffice it to say that took me on a journey that made me forget all about the kit. Fast forward to the present and a desire to refine my barista skills more. And with a good sum of money sitting in the paypal account, the order was placed for one pre-infusion kit. After all, what better machine is there to test any variance that might exist with and without the pre-infusion kit, then on a 2 group machine? That’s all folks. Three pieces. 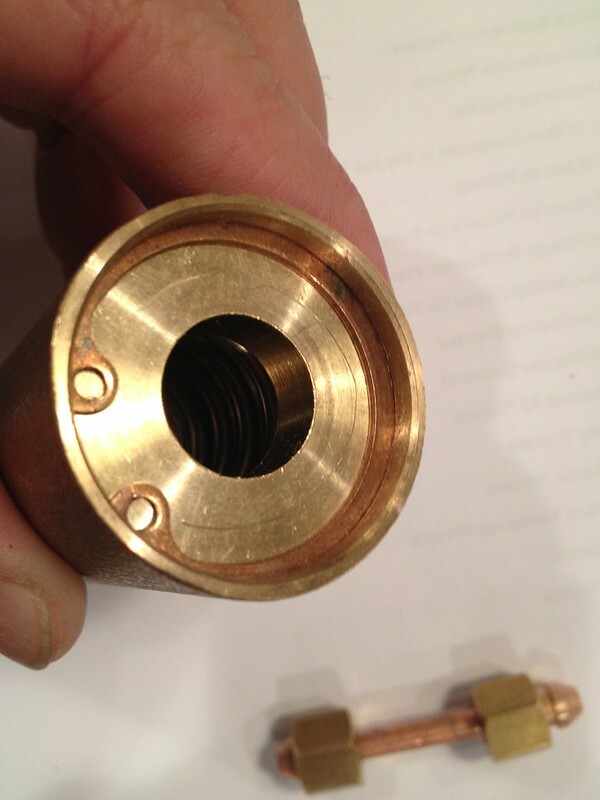 The adapter on the bottom screws into the port after removing the factory installed plug. Then attach the tube to the adapter. Lastly attach the pre-infusion chamber to the tube. If you look closely, you can see the spring that pushes against a disc at the other end. When there is sufficient back pressure (from a loaded portafilter) the spring will compress easing the initial water pressure the puck sees. A simple solution and I guess La Spaziale’s attempt to mimic the soft start of the E61 group. The installation was a breeze. It took more time to remove the panels and coffee cups from the top of the machine than it did to install the three pieces. 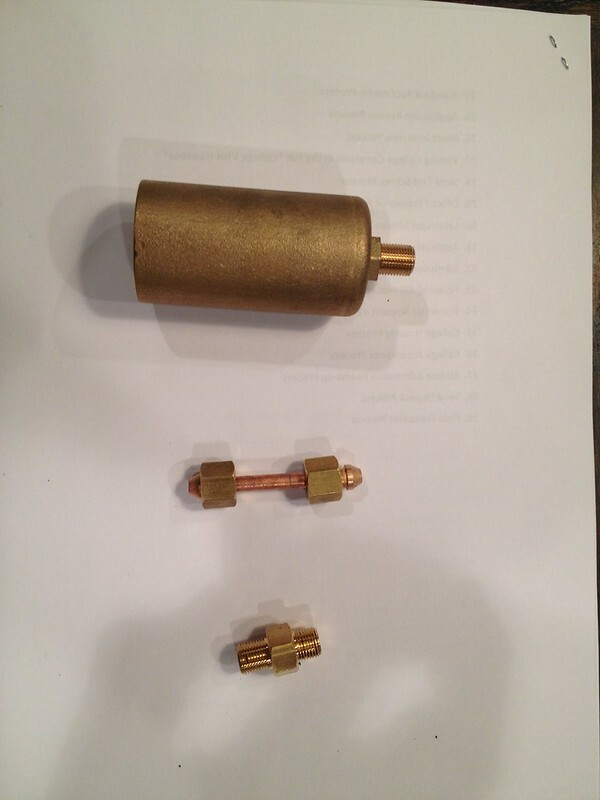 I removed the plug, installed the brass adapter and then the tube. I bent the tube less than the S1 instructions noted as I didn’t need to due to abundant clearance. Here is a view of the finished installation after the machine is put back together. This view is looking from below the front controls…where you would be if you were cleaning the floor. The chamber is barely visible. The installation went off without a hitch…and without any leaks. From the start the chamber has worked as expected. I have been focusing on basic techniques of weighing in and weighing out recently and it has made massive improvements in shot-to-shot consistency…lazy in my old age I guess. 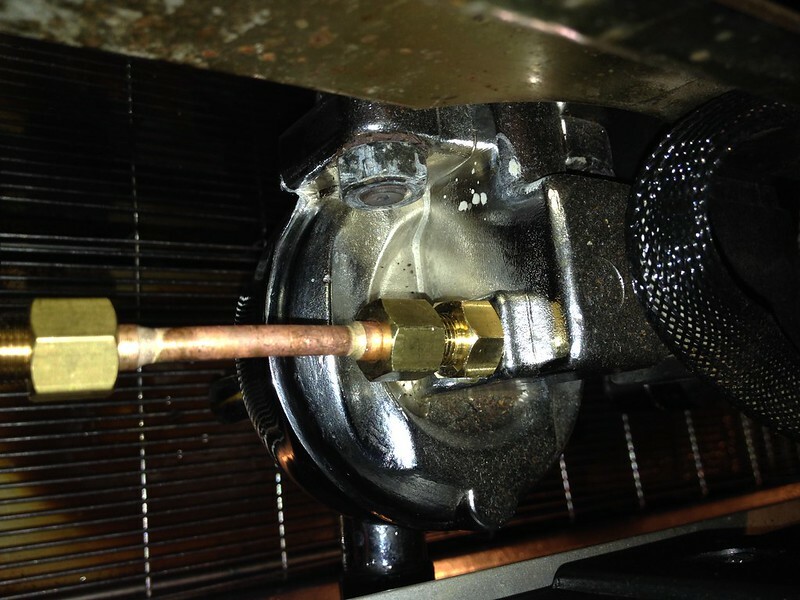 With that said, I have not had a bad extraction (knock on wood) since I have installed this on the machine. The preinfusion takes about 5 seconds to bring the portafilter up to full pressure and it does seem to help make sure the integrity of the puck is not disturbed. Next up, side-by-side testing with and without preinfusion.